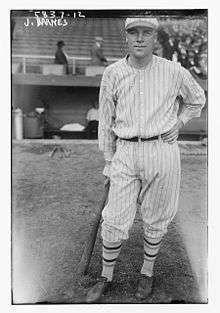 Jesse Lawrence Barnes (August 26, 1892 – September 9, 1961) was an American pitcher in Major League Baseball. Barnes began his major league career in 1914 with the Boston Braves. In 1917 he led the National League with 21 losses. On October 2, 1917, he became the only NL pitcher to walk two times in one inning. In 1918, Barnes was traded to the New York Giants. He had three very good years with the Giants. On the last day of the 1919 season, he won his National League-leading 25th victory, 6–1, over Lee Meadows and the Philadelphia Phillies at Polo Grounds. The game was played at a feverish pace and lasted a mere 51 minutes, a major league record that still stands as the shortest nine-inning game ever played. In 1920 he had 20 wins, following with 15 wins in 1921 and two victories in the 1921 World Series against the New York Yankees. Then, in 1922 he hurled a no-hitter against the Phillies. He returned to the Boston Braves in 1923, playing for them three years before joining the Brooklyn Robins from 1926 through 1927. For the second time, he led the league in losses (20) in 1924. His younger brother, Virgil, also pitched in the majors, and both were teammates with the Giants from 1919 to 1923. On June 26, 1924, Jesse opposed Virgil in the first pitching matchup of brothers in major league history. Virgil did not have a decision while Jesse was credited with the loss as the Giants defeated the Braves‚ 8-1. The Barnes brothers will match up four more times during their careers‚ the first, including three days from its date. The baseball author and analyst Bill James is also a distant relative of them.